Taking a break from working on The Big Exhibition Quilt today as I need to tack the quilting before doing any more hand stitching (hence procrastinating as I really hate tacking!). This gave me a chance to work on some of the ideas from the last rock/tree object and take a next step. 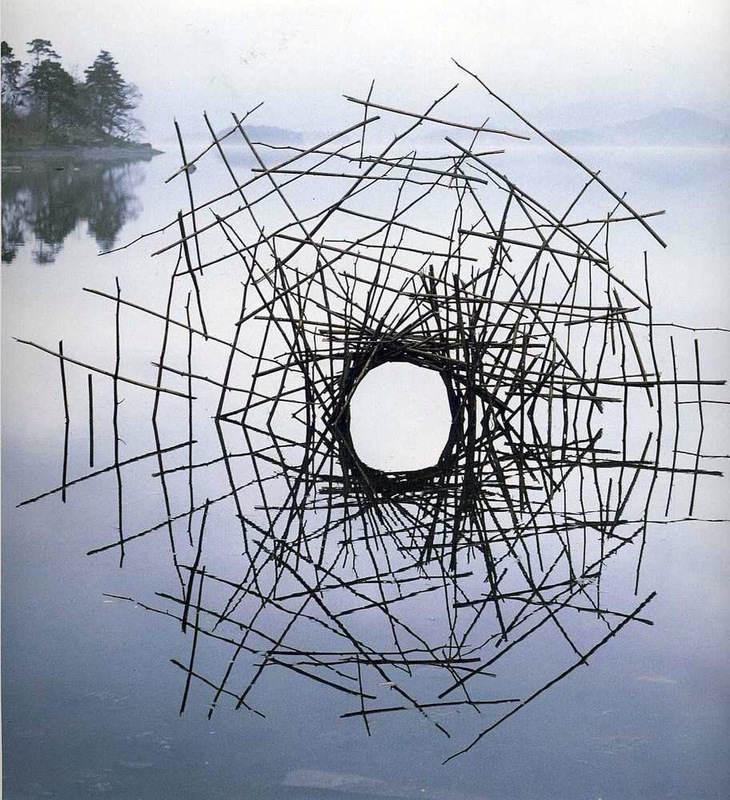 I tried to look at some of the land art inspirations I have been researching and incorporate some of the ideas I really like. I’m also starting to try to incorporate more of the textile skills I already have and transform them into new materials. I have done rather a lot of ‘dimensional stitching’ so far, but not really looked at the patchwork or quilting techniques I know. Definitely a plan for term 2! For now though, these were the two experimental objects I made today. This was used a weaving technique with a very fine and delicate silk thread – I liked using just a single strand all the way through the piece as well. 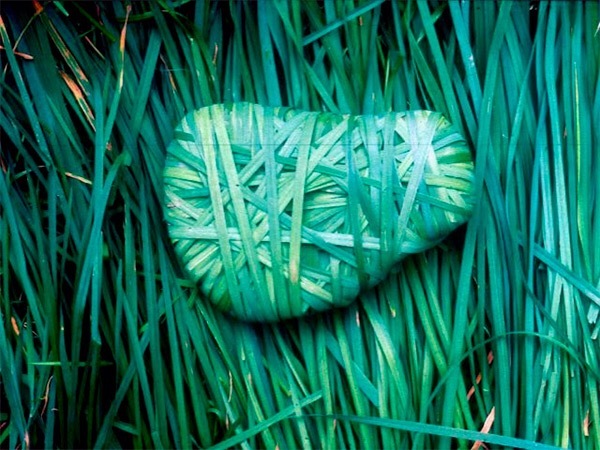 The rock, meant as an offering, is trapped within the structure which is weaved around it. This is in order to show how the air element – represented here by the delicate silk and space within the weave, has the power to control and overcome earth. 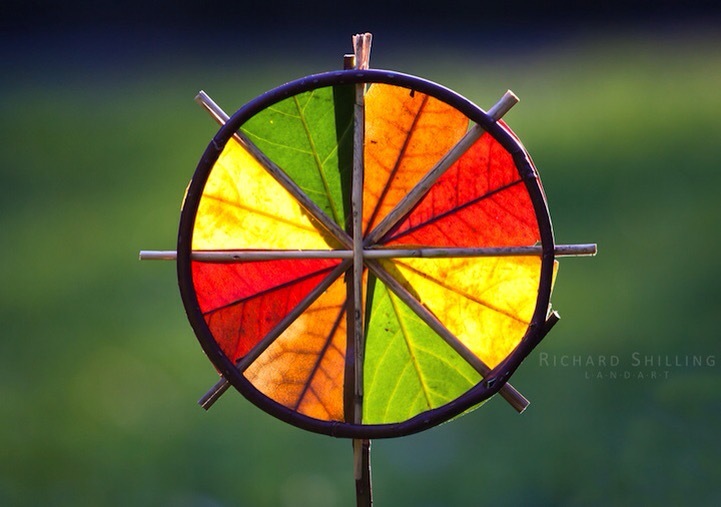 This was to some extent in response to the work of Richard Shilling, and starting to use my patchwork skills – I need to collect some more newly fallen leaves to see how the texture of fresh leaves can change the object. 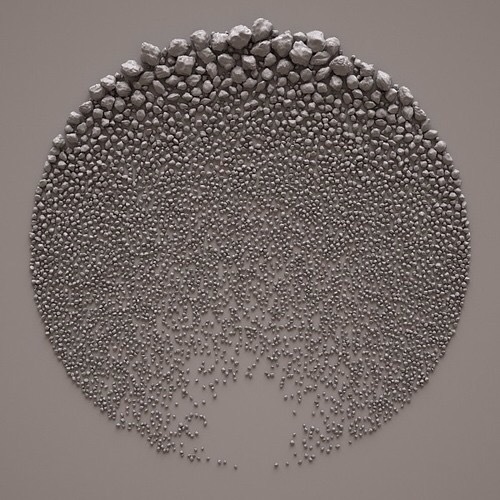 I really liked this work, and this this is an interesting direction to explore. 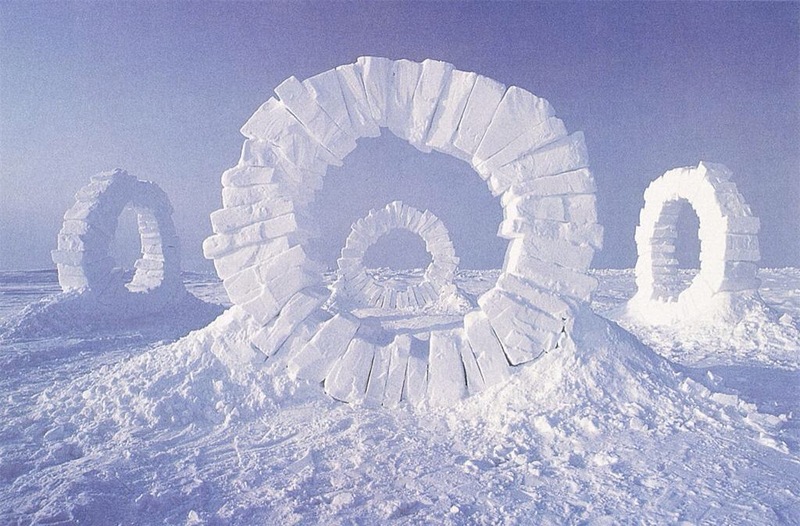 This entry was posted in 03.5 Unit 1 experiments and tagged elemental, Land art on 28 November,2014 by antalbot. 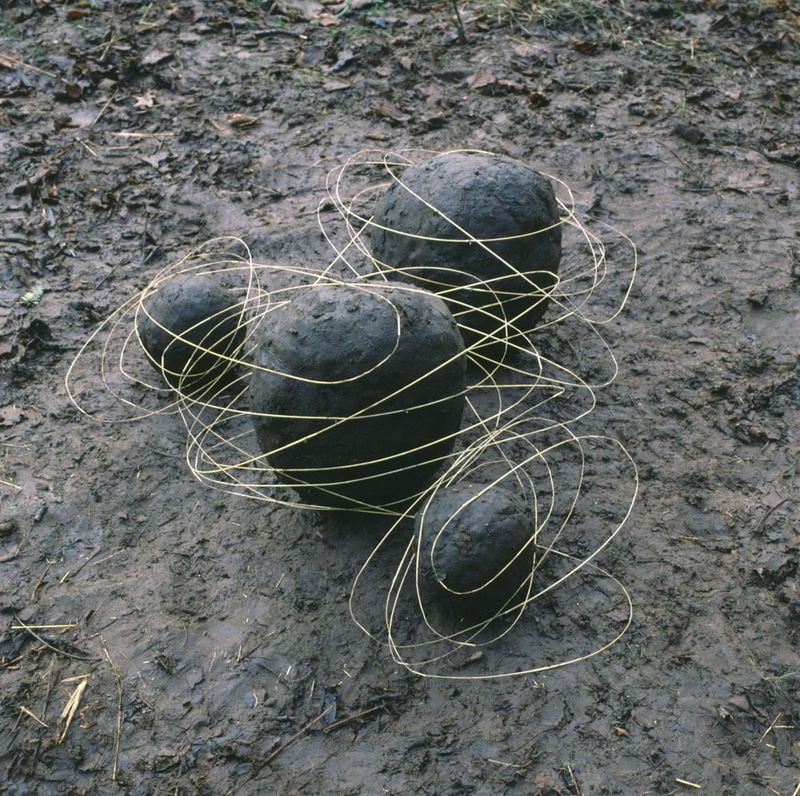 A few land artists – people working out in the natural environment with raw, elemental objects, often found and used in the same spaces. 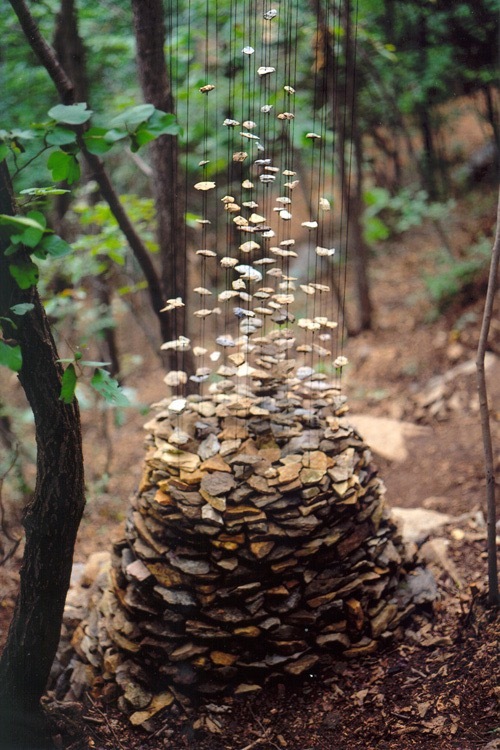 Many have an ephemeral quality, while others are significant large scale site-specific pieces. Others are temporary, fleeting glimpses of beauty and order, before falling back into chaos. 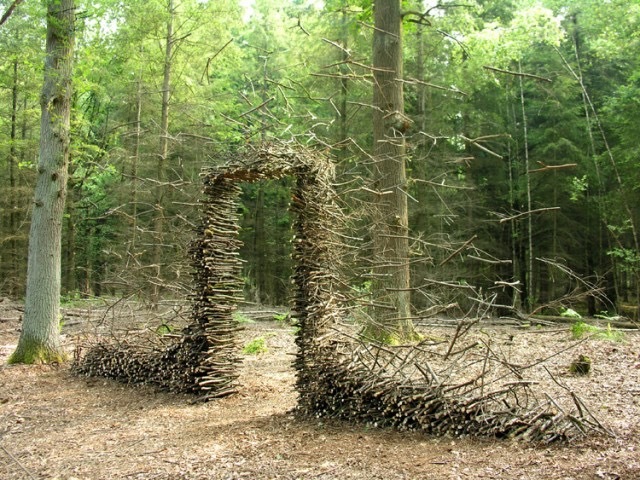 This entry was posted in 04.1 Artists references and tagged Land art on 27 November,2014 by antalbot. The second display was an almost exact opposite: Pilgrims, healers and wizards, a study on Buddhism and religious practices in Burma and Thailand. It was a really interesting display of Buddha images, amulets and paintings; there was also a lovely case of offerings – gifts given to increase karma, appease potent beings, ensure protection and enable a devotee to access a being’s power. 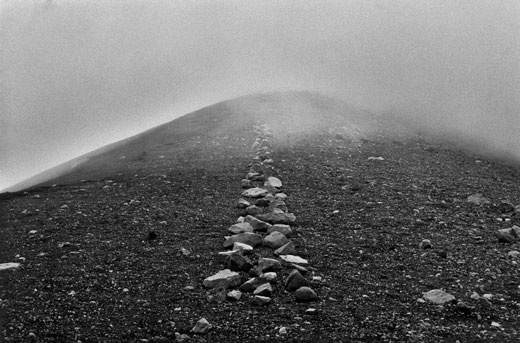 This entry was posted in 04.2 Exhibitions on 26 November,2014 by antalbot. One of Maiko’s suggestions in our last tutorial was for me to consider some mythological objects and uses, and use those to try to get some stronger meaning into my work. Looking back it has been a bit ‘functional’ instead of speaking with strong messages. I have some good ideas of research to do – a few museums to visit, places to go, books to read etc. but not sure how much will realistically get done in the 15 days left before going away, ontop of everything else. Always good to start though! and in-between getting more work done on my City & Guilds quilts, I have had an idea of something to explore. The first inspiration source was from an episode of Masterchef on catch-up TV I was watching yesterday. One of the young chefs on the show was taking about how he likes his food to tell a story – this one dish he made was flavours from his childhood farm – according to Mr Wearing, the emotion and passion for the ingredients could be tasted in the food. This dish also spoke of “grown together goes together”. I’ve written about this before on this blog, and as something of a foodie / food-lover, I can attest to this being true. Now I like a tasty pie as much as the next person, but also quite enjoy dishes which do speak of something beyond just some ingredients stuck on a plate – as long as the flavour is not comprised by prettyness. This can translate straight into any other craft – you get a more powerful piece when you can see a good message / narrative coming through alongside good quality making. I have been cooking much longer than I have been making, so I thought to myself, why not see how I would approach designing a michelin starred menu and then translate this into my making? I work with natural ingredients, no chemical additives or preservatives. I like dishes which offer a respectful modern take on traditional classics, but still taste of what it should be. Don’t give me a ‘deconstructed lemon tart’ by breaking up biscuits and shoving lemon sorbet on a plate. Hmm, well now. My first thought on this was to make something which used materials I had to hand and which meant something to me (not just ordered off the internet). What I found to hand were three things – a bit of tree I found outside the house which was left over from my Tesseract made back in September; bramble sticks I cut from the weaving workshop with Shane; and rocks I picked up from the beach in Littlehampton last week. Bit of a theme there! This is something I did thoughout my childhood (and beyond) – I would pick up random bits and bobs from beaches and riverbanks across the country. My dad was, and still is, an obsessive angler, so we often found ourselves sat on a waterside on weekends and holidays. Everytime I would bring back shells, sand, rocks, pebbles, twigs and walking sticks from everywhere we went (I think many of these are still stored in my parents’ house…). I never made anything with them, just brought back something of the land, river or sea. Maiko also suggested that I consider making something in response to one of the artists I’ve researched so far. Dail Behennah and her modern basketry is the person who keeps coming back into mind. In a spare hour I found today, thought I could combine all of these ideas flying around my head and just make something. This is the result. The object is reminiscent of the offerings and shrines left in sacred trees across many cultures. There is a huge wealth of mythology and folklore around trees. In the UK, Druids were thought to use forest groves for worship, and many neo-pagan groups will use prayer ribbons tied to tree branches in modern ritual practice. The trees are the physical representation of the wisdom of the earth, as if drawing on the deep unconsciousness of the world below to rise up towards the light. Like the sacred trees, all humans are born from the mother earth and are dependent upon its providence for survival. Now, I wonder how much of this do other people read in the object? 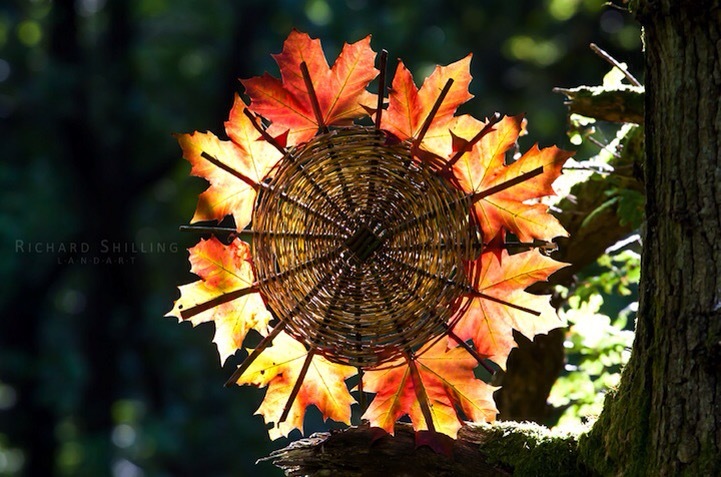 This entry was posted in 03.5 Unit 1 experiments and tagged basketry, found objects, sacred tree on 25 November,2014 by antalbot. I have been looking again at all of the key themes and contexts which have been in the four drafts of my proposal so far. I want, for version 1.5, to create something which pulls out these main threads into something core which runs through them and which encapsulates what has been underneath what I have been making towards the end of term. v1.4: Seen / Unseen, the search for the ghost in the machine – what can the interplay of light, shadow and space represent about the nature of reality; or visual perception of what we believe to be reality filtered through the inner world within our minds? 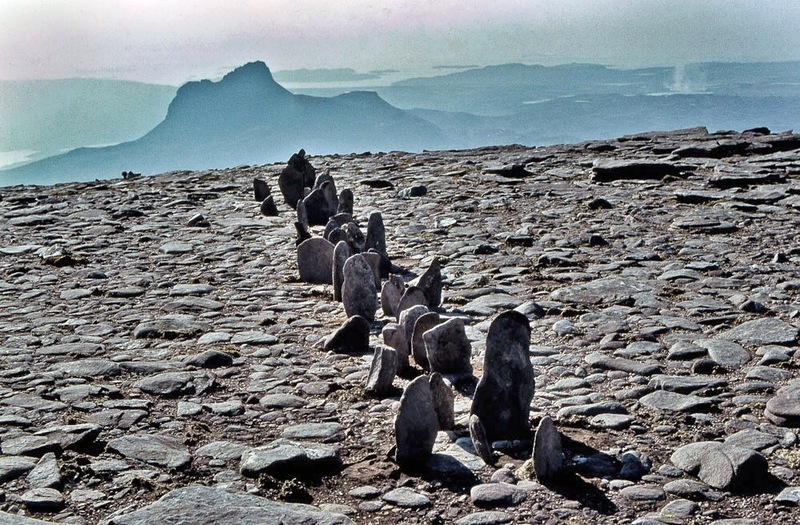 The way that I see it – humans have since time untold, had the desire (need?) to try to explain the world around them and the fundamentals of their existence on the planet on which we find ourselves. 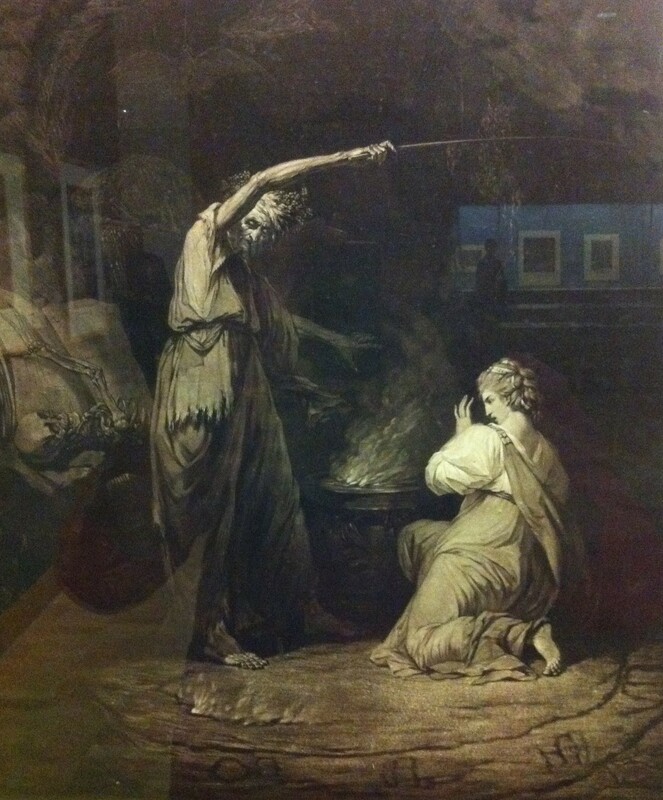 In early history, storytelling was used to describe how the world was created, how the world works and the eternal cycles of life, death, rebirth and the human emotions of love, loss and betrayal. These themes are repeated the world over in every civilisation on the globe both past and present: through myths, legends, religions and shared stories. In modern history, over the last few centuries, we have slowly evolved from our descriptions of the world through god and goddess, to a language of mathematics and science – looking outward to the farthest reaches of the cosmos and inward to the smallest particle of matter we can identify, and beyond. Both of these however are just different ways of addressing the same human need, that of interpreting the nature of reality. No matter who you are, within each human is the same desire to know man’s place in the universe. This is played out differently in every person – some as deep thinkers and philosophers, and others who just silently question truth at occasional times throughout their lives. Our societies have used the languages of mythology, magic and mathematics to both interpret and try to manipulate what we observe of the world. These languages collide / coincide as we look forward into the future and wonder what we will see there. I think this dichotomy in some form exists in all of us as we balance our traditions, cultural heritage and history with the ever-moving, modern, technological age; whether or not people still tell their children tales of old gods or fairies roaming in the hills, or follow any of the worlds theistic religions, or nature-based religions or anything else. How do we find sacred space in the never-sleeping city? I haven’t quite got my finger on my question yet, but I think my aim is as follows: The subject of my research is to explore how we, as humans, try to interpret and manipulate the nature of reality. I will conduct this exploration by considering the boundaries between layers of reality, considering our physical reality (the fundamental, inherent nature of the world and the wider universe), and our cultural reality (our understanding of how things are through stories, myth and superstition) and our inner reality (our perception of truth filtered through our own mind). Objects can be used as levers to interpret, understand or to manipulate the nature of things; they exist between these different realities – the physicality / materiality of the object and our perception of it which differs between people and through interaction with the object. These boundaries intersect upon the object – 1) the object space existing within and around the object, 2) the inner space of the user interacting with the object and 3) the space beyond. Eventually, all things merge into one, and a river runs through it. The river was cut by the world’s great flood and runs over rocks from the basement of time. On some of the rocks are timeless raindrops. Under the rocks are the words, and some of the words are theirs. This entry was posted in 03.3 MA Project proposal and tagged mythology, reality on 25 November,2014 by antalbot. I’ve been mulling over the place where my new proposal is at over the week ‘off’ from college work to bake cake. I think I have an idea of how to combine the key ideas I’m working with – which come from all 4 versions of my proposal so far! For now, my current theme word which I will focus on as a minimum for the next two weeks (before I head off to China!) will be BOUNDARIES. I will wait until later to write up more words on what I mean by this, and hopefully more progress on my updated proposal question, combining mythology, magic and mathematics (working title). For now, here are some photo inspirations I took last week to show what I mean from a winter visit to Littlehampton West Beach Nature Reserve. This entry was posted in 03.3 MA Project proposal, 03.5 Unit 1 experiments, 05 Photography and tagged beach, boundaries, elementals on 24 November,2014 by antalbot. 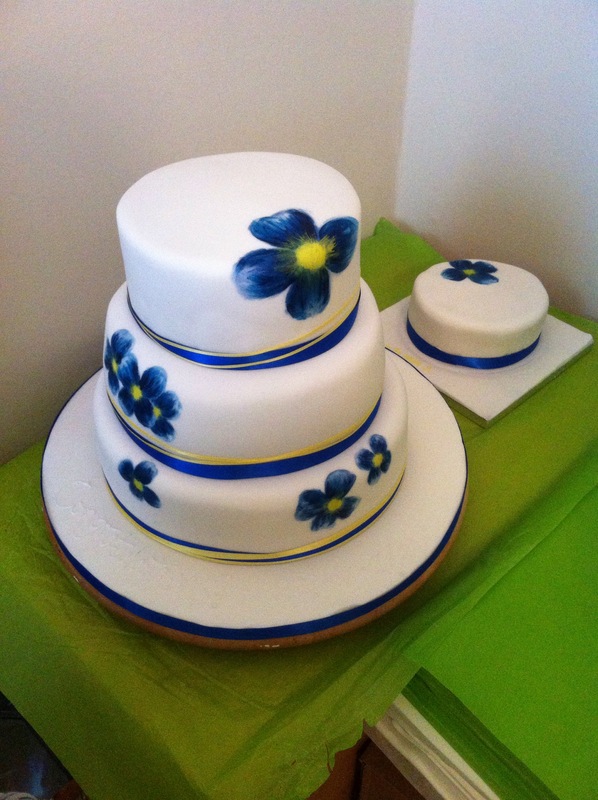 A long week with one focus – a family wedding – and my pleasure and pain of being responsible for the Wedding Cake. I haven’t managed to get any other work done at all last week, as unfortunately the house cleaning, the cake and the family entertaining took up all of the time I had. However, it was hopefully worth it in the end, and the happy couple seemed to enjoy it! 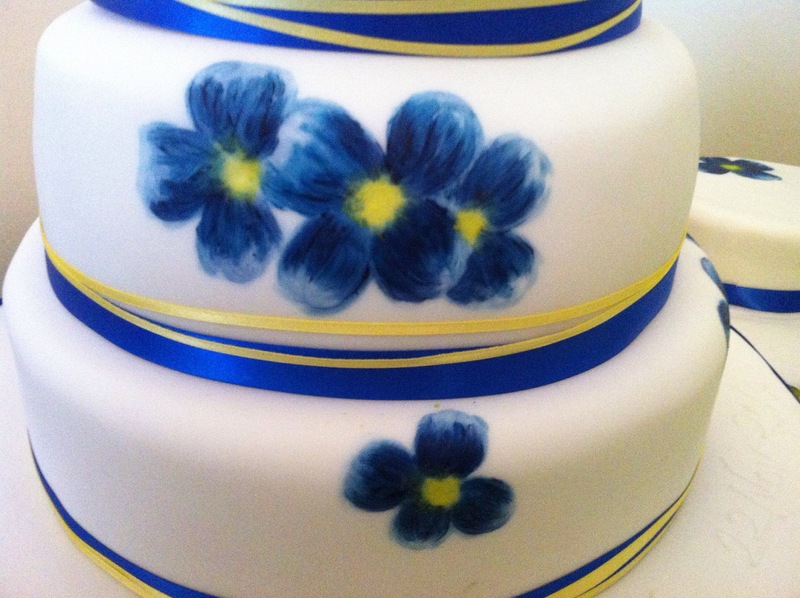 Definite artistic progress in the cake design department too – with an elegant but contemporary design I devised based on interviewing the clients; Blue painted flowers to match the colour scheme and theme of the wedding. Plus a very, very tasty cake inside…! Next week, back to work and priorities will be to catch up on some thinking / making on my proposal and get more work done on the Exhibition Quilt. Sadly I don’t think I’ll be ready to hand this in on Thursday when I see my C&G tutor, especially considering how long the stitching has been taking so far. This entry was posted in Uncategorized on 23 November,2014 by antalbot.